It’s almost September. Birders know it by the sudden absence of earlier migrants at the local patch and the appearance of other species moving through woodlands, wetlands, and gardens. They are racing south ahead of the change in the weather and birders can’t lose by doing the same. Not only will they meet up with many of those summer migrant species from back home, they will also see hundreds of resident species, a bonanza of lifers if you will. That would be sites like Quebrada Gonzalez, Arenal Observatory Lodge, and near El Cafecito. Although birding time in the foothill zone is well spent on any trip to Costa Rica, these days might be even better. Thanks to altitudinal migration, choice species like Bare-necked Umbrellabird, Yellow-eared Toucanet, and Lovely Cotinga venture down to the foothill habitats at this time of year. Many tanagers and other frugivores join them to feast on the bounty of fruiting trees and with this year having a very wet rainy season, it looks like a lot of food could be available. 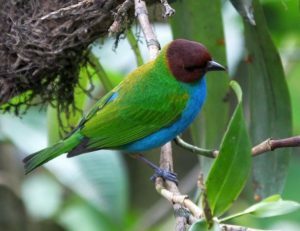 The beautiful Bay-headed Tanager is a common foothill species. Migration doesn’t need to be relegated to birding back home. It also happens in Costa Rica and it can be fantastic, especially on the Caribbean coast. 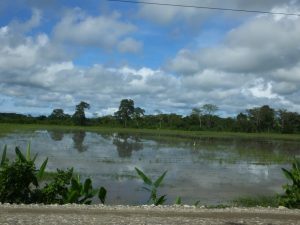 Birders visiting Tortuguero or sites south of Limon will be smack in the path of thousands of migrating swallows, Purple Martins, Chimney Swifts, wood-warblers, Eastern Kingbirds, and other species. 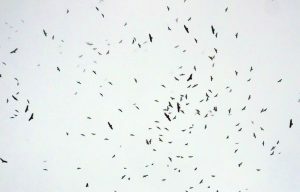 The River of Raptors will also be happening on the coast as well as inland. While visiting birders might not want to spend any extra time looking at sandpipers that can also be seen back home, we could always use more data on birds that migrate through and winter in Costa Rica. Not to mention, since shorebirding in Costa Rica can be easily combined with looking for Mangrove Rail and lots of dry forest birds, please consider shorebirding during the trip and eBirding the results. Speaking of migrants, this choice wood-warbler moves through Costa Rica during August and September, and birders wielding binoculars in the Caribbean foothills have a fair chance of finding one. I actually had two the other day around the Socorro area. Watch for these rare beauties and please eBird where and when they are seen. Lately, the wetlands located south of Ciudad Neily have been making the local birding news, I wish I had time to go there today! Photos are being posted of Wattled Jacana, hundreds of egrets and other waterbirds, my nemesis the Masked Duck, and even stellar shots of Paint-billed Crake! Lots of other local good birds are also present and it will be a prime spot to find rare migrants like Buff-breasted and Upland Sandpipers, and maybe a super rare vagrant or two. I was pleased to have had the chance to bird that exciting area last year. If the Cafe was rocking like it was the other day, visiting birders will be in for some serious hummingbird action. A stop at this roadside local cafe in Cinchona is always sublime but two days ago, there were so many hummingbirds, it was tough to focus on the delicious, home-cooked food. Coppery-headed Emeralds were in abundance, and there were more Brown Violetears than I had seen on any previous visit. 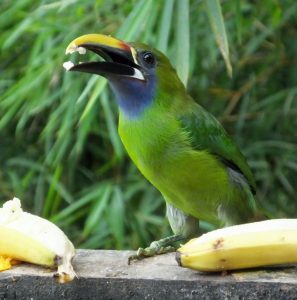 At least seven other hummingbird species also made an appearance while barbets and toucanets visited the fruit feeders. I hope to show you birds in Costa Rica this September. To support this blog and learn more about where and how to see birds in this beautiful country, see my e-book, “How to See, Find, and Identify Birds in Costa Rica”.